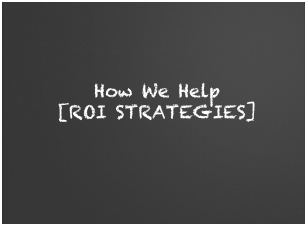 Before we dive into ROI considerations, we spend time getting to know your business. We ask a lot of questions to get a feel for what you offer and what you’ve measured in the past. But the process goes by quickly and our clients don’t feel overwhelmed by our efforts to shape an online marketing strategy and establish ROI goals. In short, we need to know what you prefer to see as a result of our efforts. It’s really that simple. If you spend your money on online marketing services, you ought to get your money back and a great deal more. We realize you have the cost of materials, labor, overhead, etc. If you spend a dollar and get two dollars, that’s usually nothing to get excited about. Online marketing does well because you tend to catch people while they’re interested. Sure, some may be in research mode. But hang into their contact information even if they do nothing more than sign up for a newsletter. We will help you find the best ways to manage your prospects so you have multiple opportunities to stay in touch with them.